This image from the front Hazard Avoidance Camera (Hazcam) on NASA's Curiosity Mars rover shows the rover's drill in place during a test of whether the rock beneath it, "Bonanza King," would be an acceptable target for drilling to collect a sample. Subsequent analysis showed that the rock budged during the procedure and did not pass the test. The image was taken during the 724th Martian day, or sol, of Curiosity's work on Mars (August 19, 2014, PDT). The rover was doing a mini-drill procedure, which is part of evaluating the target in advance of full-depth, sample-collection drilling. One step in the procedure, called "start hole," uses the hammering action of the percussive drill to create a small indentation in the rock. During this part of the test, the rock moved slightly, the rover sensed that instability in the target, and protective software properly halted the procedure. 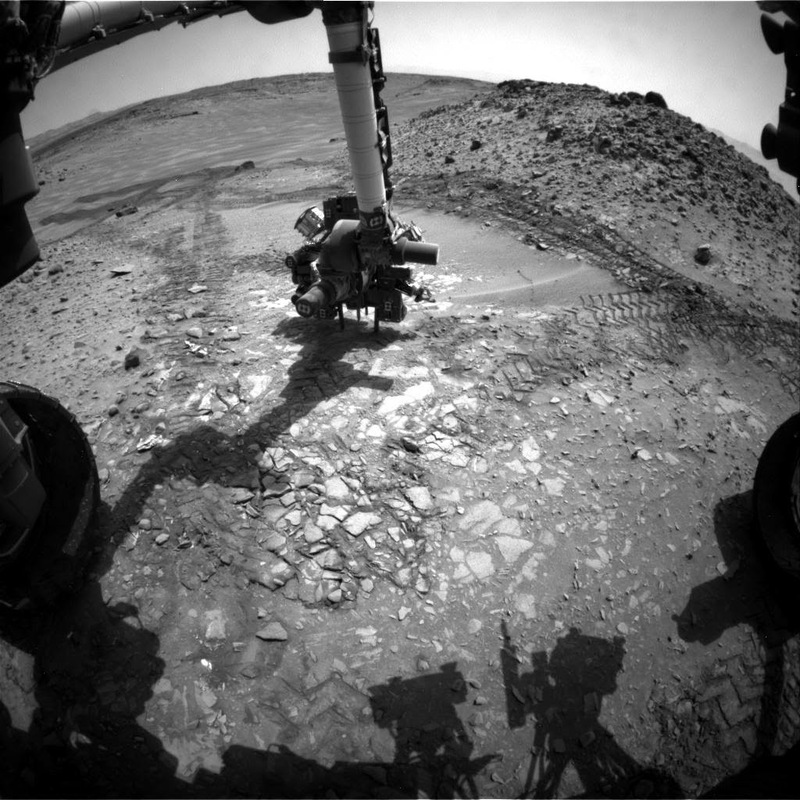 After analysis of the target's instability, the rover team decided on August 21, 2014, to drive Curiosity away from this Bonanza King site and resume the trek toward long-term destinations on the slopes of Mount Sharp and perhaps a shorter-term science destination at an outcrop called "Pahrump Hills." The site in this southward-looking image is at the northeastern end of sandy-floored "Hidden Valley." The largest of the individual flat rocks in the foreground are a few inches (several centimeters) across. For scale, the rover's left front wheel, visible at left, is 20 inches (0.5 meter) in diameter. A map showing Hidden Valley is at http://photojournal.jpl.nasa.gov/catalog/PIA18408. Note: For more information, see Mars Rover Team Chooses Not to Drill 'Bonanza King' and PIA18478: Loose Rock Leads to Incomplete Drilling.